Three-sport athletes are a rarity these days. In that case, Eric Radbourne is an extreme rarity. Because in addition to playing soccer and hockey, Radbourne plays both box and field lacrosse. Soon, field lacrosse will be his sole sport. 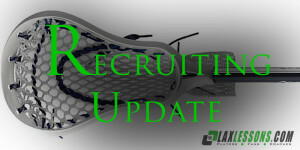 The Trinity-Pawling School (N.Y.) attackman/midfielder and Guelph, Ontario, native Eric Radbourne has verballed to the University of Vermont, a decision first reported by Joe Lombardi on LaxLessons.com’s Lacrosse Insider special coverage section. In addition, he plays club lacrosse for Edge Elite 2015, where he has been on the Edge High Honor roll (4.0 cumulative GPA). He made an all-star appearances at the All-Canada Games, and at Gait Cup. You can watch his highlight reel here. Now, here’s a Q&A with Eric on his commitment. I was primarily interested in a high standard engineering program and I felt that Vermont was the best fit both academically and athletically. I’m a good finisher and shooter and two-way player. Speed and quickness for the next level. How did you get introduced to lacrosse? I started playing box lacrosse when I was 11 and was introduced to field lacrosse a couple years ago. I played with the Edge Elite program out of Toronto last year but I have recently joined the Prime Time 2015 club team. Showcase events I participated in are Philly Showcase, National Invite 175, Bulldog Classic and Shoreham-Wading River (Fall Classic). I was also named to all-star team at Gait Cup and All Canada Games. I would like to thank my (Trinity-Pawling) coach, Nic Bell, for helping me through the recruiting process and helping me find the best fit academically and athletically. In addition, I would like to thank my Edge coach Marc Burton for helping me develop lacrosse skills for the college level. Finally, I would like to thank my friends and family for supporting me and making this possible.